Hermanus is one of the faviourite spots for landbased whale watching. Situated 56 km (about 35 minutes) drive from Pringle Bay. Explore the magic of our unique coastline and Walker Bay Whale Sanctuary up close and personal in one of our stable kayakks in the company of an experienced guide. Glide across sparkling water while marveling at the majestic cliffs and sea life. From June till December you have the opportunity to see the Southern Right Whale within the whale sanctuary from your kayak. Seeing that we are the only operator allowed inside the whale sanctuary this offers you a once in a lifetime experience. Other possible sightings throughout the year include cape fur seals, dolphins, penguins and a variety of sea birds. When you are a guest at Dreams SA Forest Adventures will give you 15 % discount on rafting, tubing, sand boarding, whale watching and shark cage diving or other activities they offer! Valid when booking directly with SA Forest Adventures and mentioning voucher received at Dreams. Boats departs daily, from our private floating jetty in Hermanus. Our memorable whale-watching trips (seasonal!) are informative and educational. We mostly encounter the southern right whales, seals, penguins and marine birds, and often see dolphins, Bryde’s and Humpback whales on many of our trips. We are licensed to approach the whales up to 50m, being curious creatures they usually come right unto the vessel. It is definitely ‘a magical experience to be treasured’. SA Forest Adventures work in close conjunction with White Shark Projects to bring you the most unforgettable experience under the water. White Shark Projects co-ordinates service delivery, conservation, education and research around one of the ocean’s greatest predatory forces. Southern Right Charters offers 15% discount on boat-based whale watching. Valid to guests staying at Dreams until further notice when booking directly with Southern Right Charters. Please notify Sothern Right Charters of being guests at Dreams when booking - essential! - and hand in voucher upon arrival. Time of yearapproximately June to December - It all depends when the star performers arrive and depart. Duration approximately 1hr 30m - 3hrs max. It depends on traveling time to the whales on that trip; the time spent with them is the same. Duration of trip is normally about 2 hours. Most of our clients find our trip life changing, informative and full of exhiliarating fun! Dyer Island Cruises must be one of the most fortunate companies anywhere for quite a few reasons. We are not only situated near the world famous Dyer Island but are also blessed with a group of wonderful people for which boat based whale watching and the conservation of the area is not a jub, but a way of life. We start our trip from the Kleinbaai Harbour (east of Danger Point). From there we move towards the Pearly Beach area where we find our highest concentration of Southern Right Whales (July to mid December)). The Southern Right Whales come to our calm bays every year from July to December to either calv and nurse their young or to mate. After spending the allowed time with these magnificent creatures we move towards Dyer Island where we view the African penguins as well as various other seabirds. Behind Dyer Island we visit Geyser Rock, which is resident to about 60 000 Cape fur seals. Between these two Islands we find ourselves in Shark Alley. Shark Alley is world famous for its Great White sharks, which makes this probably the only trip in the world where you have a chance of seeing a Southern Right Whale as well as an 80% chance of seeing a Great White shark. After this exhilarating 2 and a half hour trip we return to the Kleinbaai harbour to enjoy some refreshments at The Great White House. All our trips are weather dependant. Our clients meet us at The Great White House in Kleinbaai at least half a hour before launching time (to be confirmed). All our clients must dress warmly and wear comfortable shoes. You must confirm the trip at least one day in advance, as well as the morning of the trip. Booking is essential. Please take seasickness medication well in advance if you are prone to motion sickness. If you stay at Dreams you receive 15% discount on the prices for Whale Watching!!! Hermanus is regarded as the whale watching capital of South Africa and there are few better ways to see these gentle giants in their natural environment than on a boat based whale watching trip. The tours are operated from the New Harbour in Hermanus and departs 3 to 4 times daily depending on the time of year and weather and sea conditions. The permit issued to the operators entitles them to approach the whales up to 50m and then stop, allowing the whales to decide whether to approach the boat or not. Being curious they normally approach the boat and enjoy a quick peek at their visitors. This is an experience to be treasured. A qualified whale specialist guide is on board to relate interesting facts and answer any questions en route. One usually encounters seals, penguins, marine birds, southern right whales and often see the bryde's whale, dolphins and humpback whale at certain times of the year. Duration: The duration of the trip depends entirely on how far away the whales are – 1 ½ h to 3 h. Once there, the boat is permitted to spend 20mins with each pod of whales. Fully compliant with SA Marine Safety Association requirements. Experienced crew and registered skipper at the helm. Season: Approx June/July to early December, it all depends on when the star performers arrive and depart from our shores. All trips are subject to weather and sea conditions. Pickup and scenic transfer we collect you from Hermanus and drive you to our home base in Kleinbaai. White Shark Projects is working in the unique marine area off the southern Cape coast, our skippers log more contact with Great White Sharks than anyone else worldwide. Our boat is an 11 metre, 4 ton catamaran with all the latest electronic and safety equipment. The boat was custom built for shark diving so there is plenty of space for everyone to view the sharks in comfort. While she can take 30 passengers, we have limited our licence to a maximum of 20 passengers plus crew to ensure client comfort. White Shark projects has set a bench mark for responsible tourism in the industry. This involves sharing the countri's natural and cultural riches, whilst contributing positively to the preservation and growth of the local communtiy and environment. 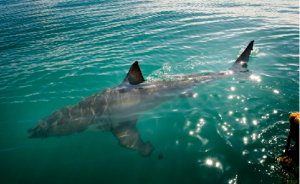 We are actively involved with the research projects of the South African Shark Conservancy. White Shark Projects has implemented a dorsal fin tracking program whereby individual pictures of the 3 dorsal fins of Great Whites are taken and fed into a database. This will aid in identifying the population dynamics of the Great White Sharks in the Gaansbaai area. White Shark projects works in partnership with the Great White Shark Protection Foundation of South Africa and is a registred member of the South African Tourism Services Association (SATSA), Fair Trade in Tourism and many more. The White Shark Projects diving and viewing centre offers day trips, team-building activities, incentives, VIP trips and group bookings. The best season for viewing Dyer Island is a good place to see sharks all year round. So, weather permitting, our tours run every single day. The prime viewing time is in our winter mounths when the sharks have a particularly active feeding pattern. The following guide is based on our observations over the past 8 years. Allow for an overlap between seasons. Afternoon tea on your return to dry land. A DVD of your trip - we have a professional videographer on all our trips. Breakfast at our meeting place. Your day at sea and a lecture on board the skipper of the day gives a short lecture on the Great White Shark. He explains how we work with the sharks in the area. We spend 2-4 hours at sea, depending on how often the sharks visit the boat. Be sure to ask as many questions as you can think up! Diving and viewing our cage takes 5 people at a time. Each person spends about 20 minutes in the cage. All scuba equipment, including 7mm wetsuits, is provided – you don’t need a scuba license to cage dive. Visit the Salandra Country Market open every Sunday from 9 am to 15 pm. The Market is a Food and Crafts market catering for the whole family come rain or sunshine - if it rains we have a shed to go into. It also has kids entertainment. Market on the R43 between Botriver and Hermanus at the Shell Service Station and Farm Stall on the grass patch - where the big garden pots are standing.